Work being carried out by WWT’s Research Unit to track Pink-footed Geese in relation to offshore wind farms, with the support of Ørsted, has again seen an increase in catch effort for this species during winter 2017/18. Two catches, both at WWT Martin Mere in Lancashire, yielded a total of 87 birds: 26 in October 2017 and 61 in March 2018. A new study being carried out by Hull University, looking in to the migratory routes of Pinkfeet wintering in eastern England, began in January 2018. As part of this work, 59 Pink-footed Geese were cannon-netted in north Norfolk. Any Pink-footed Geese that are not carrying GPS devices, have all been marked with the usual grey collars with black lettering (see the colour-marking tab of the Pink-footed Goose species account for the possible ring combinations). Attempts to cannon-net Greenland White-fronted Geese on Islay proved fruitful with two catch attempts by WWT’s Research Unit in February 2018, yielding 33 geese caught of which 31 were new birds and two were recaptures. Seven Greenland Barnacle Geese were also caught as part of these catches. The Whitefronts are being ringed as part of a study that is looking into, amongst other things, the population dynamics of different flocks and links with the overall population. White-fronted Geese have been marked with white leg rings and orange neck collars, which have three black characters – sightings should be reported to Tony Fox tfo@bios.au.dk. The Barnacle Geese have white leg rings with three black characters and a plain coloured ring (different colours used) on the other leg. The Bewick’s Swan is becoming an increasingly difficult species to catch in the UK. Two cannon-netting attempts on the Ouse and Nene Washes failed to catch any birds; however, a swan pipe catch at WWT Slimbridge in January 2018 caught ten birds, which were all ringed and screened by x-ray to check for shot (see here for further info). Over the winter, three swan pipe catches took place at WWT Welney in Norfolk, WWT Martin Mere in Lancashire and WWT Caerlaverock in Dumfriesshire, targeting Icelandic Whooper Swans. In total 134 Whoopers were caught which included 95 newly ringed birds and 39 recaptures. Both species are caught as part of WWT’s long-term life history studies, looking at movements and survival. Details of the possible ring combinations can be found on the colour-mark tabs of the Bewick’s Swan and Whooper Swan species accounts. 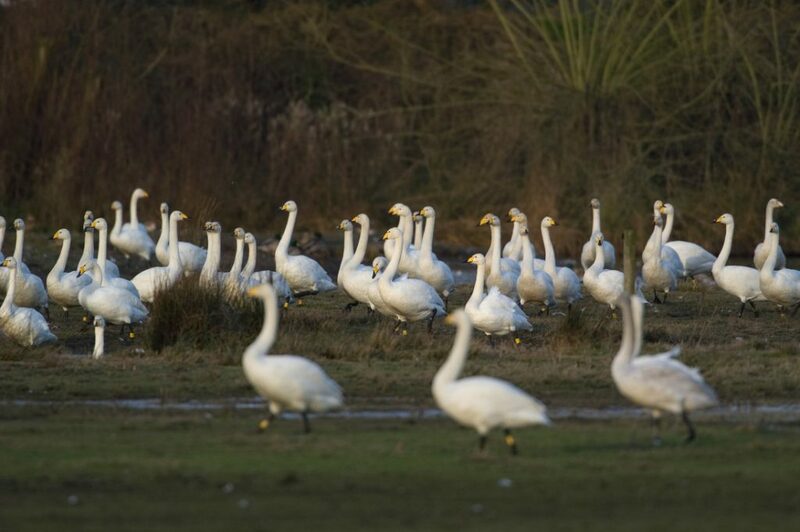 Here in WWT’s Monitoring Unit, we have been kept busy over the winter processing thousands of re-sightings of colour-marked birds, mostly of Whooper Swans. During winter 2017/18, 5,750 ring sightings of 473 individual Whoopers were reported to us. These sightings were added to the ever increasing database, which now holds an incredible 951,709 records, with the first record from 1985. Whilst we are used to entering sightings of Whooper Swans from their usual winter haunts in the UK, we were surprised to receive sightings of three Icelandic ringed Whoopers (Orange ZTB, ZTD and ZTF) from The Netherlands. The family unit consisted of a parent (ZTB) and two cygnets from the 2015 breeding season which appear to have spent the winter together in the Friesland area.